An alternative to the remote tweak is the stark vpn , no more istallation of a tweak , this doesn't disconnects as frequent like the remote tweak on tweakware , the stark vpn is pretty fast and stable, follow the below stops to get on board now!! Firstly, you should install and launch Stark VPN by clicking here. 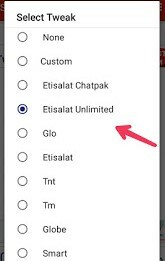 After launching it , under SELECT TWEAK: select ETISALAT UNLIMITED. 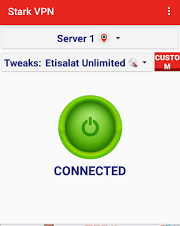 Then use any of the FREE SERVERS to connect and browse unlimitedly..